In the hectic days and weeks counting down to the opening of Oriole Park at Camden Yards in 1992, with our museum engaged in myriad activities and events, my primary focus was the dedication ceremony that had been scheduled during the Saturday evening, April 4th, black-tie gala that would provide 4,000 guests with a sneak preview of what everyone else would see at the home opener two days later. 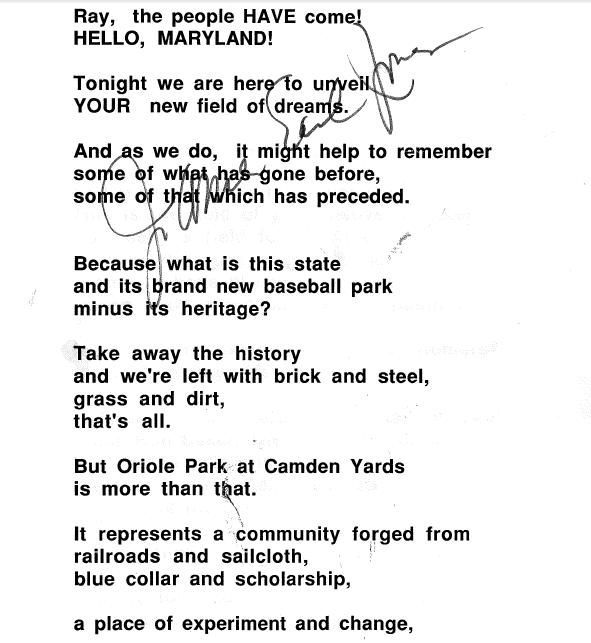 My job was to write the park’s dedication speech, to be recited by none other than the distinguished actor, James Earl Jones, and then establish a long-distance line of communication with the “Field of Dreams” star, presently in England working on a new feature film. 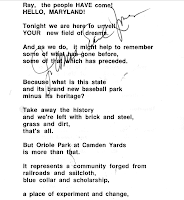 Back then, before the days of global internet and cellular service, transatlantic dialogue was slow and tedious, but by the time he arrived in Baltimorethe afternoon of the 4th, we had edited the speech to his liking, while at the same time securing the signoffs of Maryland Governor William Donald Schaefer and Orioles president Larry Lucchino. With an able assist from Baltimore actor and museum enthusiast Doug Roberts, I was also working with the MorganStatechoir, which was providing a wonderful choral arrangement to accompany Mr. Jones’ powerfully evocative baritone testimonial. Doug and I enjoyed an afternoon rehearsal led by Morgan’s choirmaster, the brilliant Nathan Carter, before I set off to fetch James Earl from a high-end downtown hotel. While waiting for the famous actor in the hotel lobby, I was entertained by a formally attired bride and groom, who were just about to exchange their nuptial vows near the hotel’s grand staircase. But then down those steps strode Mr. Jones, whose celebrity caused a brief hiccup in the ceremony, as the bride and groom stopped to get his autograph! And then it was show time. The choir sang, the actor spoke, the new ball park was dedicated, and my words never sounded so good! Happy 20th anniversary, Oriole Park at Camden Yards, you remain baseball’s best!